This living room design is a classic example of how the use of colours can change the entire ambience of the living space. 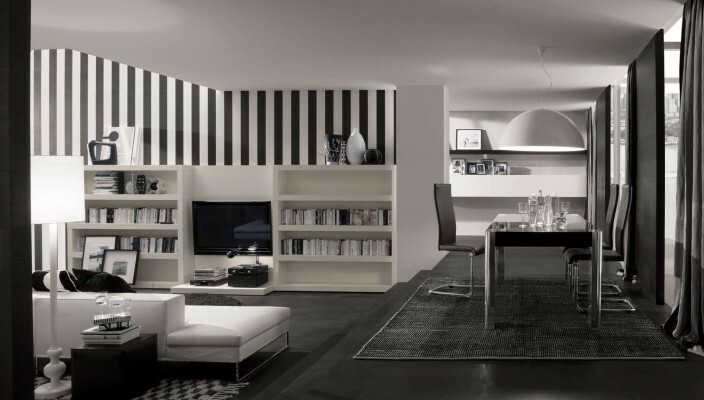 This is a divine mix of the two contrasting, yet complementary colours of black and white and how their use in specific objects can turn a room from drab and dreary to lively and sophisticated. The room uses geometric patterns and block prints in black and white spread cross the floors and the wall, creating design magic. The furniture is all mostly in white to the left, with bookcases filled in the white volumes of a bibliophile. The furniture to the right is an eclectic mix of dark and rough-hewn oak wood and the intricate and richly textures furnishings in the form of a Persian rug beneath the dining table. The white sofa set is mounted upon chrome legs and faces an entertainment unit set at the heart of the bookcase.